The HP SureStore E FC10 disk system is a high speed, low cost storage array compatible with HP RAID controllers and HBAs. Disk drives, bus control cards, and power supplies are all redundant and hot-swappable. 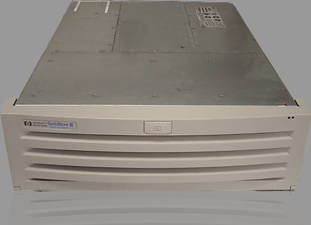 The FC10 enclosure accepts 2 Gbps FCAL disk drives. Over 700 GB of storage can be attained in a single enclosure when (10) 73GB 10K Disk Option A6487A drives are installed.